When you walk into the office in the morning do you have to deal with the plethora of water buckets strewed throughout the building? A leaky roof can be anything from a major pain to a complete disaster when it comes to your business. Don’t start pulling your hair out just yet though, you may not need to completely replace your existing roof. Did you know that you can typically stop a small leak by applying a roof coating over your existing roof? 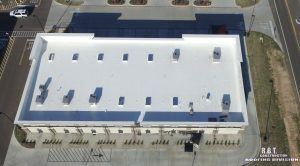 If you’d like to learn more about roof coating for Texarkana, TX building, call the professionals at R.B.T Construction Roofing Division today at 903-691-0931. Have you ever seen someone spray paint a car? Well, a roof coating kind of works the same way. Typically, a rubberized coating is sprayed over the existing roof creating an additional waterproof barrier. A roof coating can help out with a number of different roofing problems. Leaks- Are you having to put out random buckets every time it rains? A leaking roof can be a major nuisance, but it can also lead to disaster in the form of mold and ruined inventory. Most small leaks can be treated with a simple roof coating giving you a double layer of protection from the elements. Eco-friendly- Do you own a warehouse that turns into the 9th circle of hell during the summer? Dark colors just soak up that summer sun eating up all that expensive cold air. With a roof coating, you can actually place a reflective coat over your existing roof. That way it won’t soak in all those hot rays. Longevity- Your roof takes a beating every day. The intense UV rays that hit it all day can create irreversible damage to the roof. With a roof coating, you can actually extend the life of your current roof. It does this by acting as the first line of defense on those hot summer days that punish normal rooftops. So when you’re looking for the best roof coating in Texarkana, TX call the professionals you can trust at 903-691-0931. We’ve been providing the Ark-La-Tex with quality where it matters for over a decade. When you’re looking for honesty and integrity you know you can trust the experts at R.B.T Construction Roofing Division. We’re passionate about one thing, and one thing only, and that’s commercial roofs. Updated on August 30, 2018 at 1:06 pm by R.B.T. Construction Roofing Division.